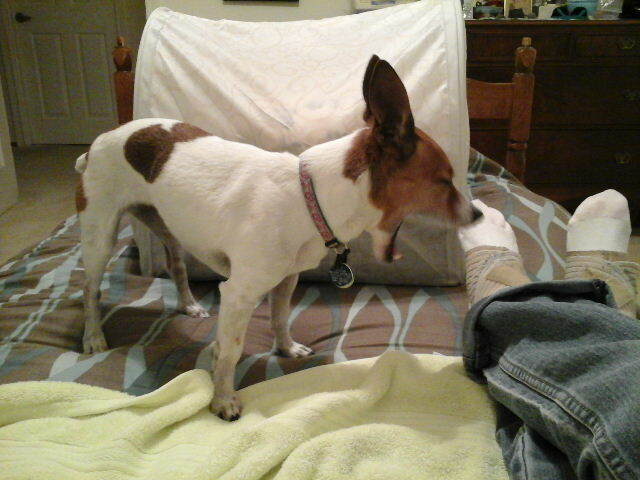 The other night Misha walked right in front of me and yawned. I think she wanted me to know that it was time to go outside, get her treats, and get to bed. Off we went for the last potty break, then to play some hide and seek with dog treats. Misha is really tired. Look at that yawn! Normally, I put the tent on the floor. She either sleeps at the end of my bed, next to me (hogging most of the bed), or in her tent. She prefers the tent when it is cold as it has her favorite heat reflecting blanket inside. Heat reflecting blankets are also called “self warming”. When a dog (or other animal, including humans…LOL) lays on it it reflects their body heat back to them. It is much safer than heating pads and last longer than microwavable warmers. 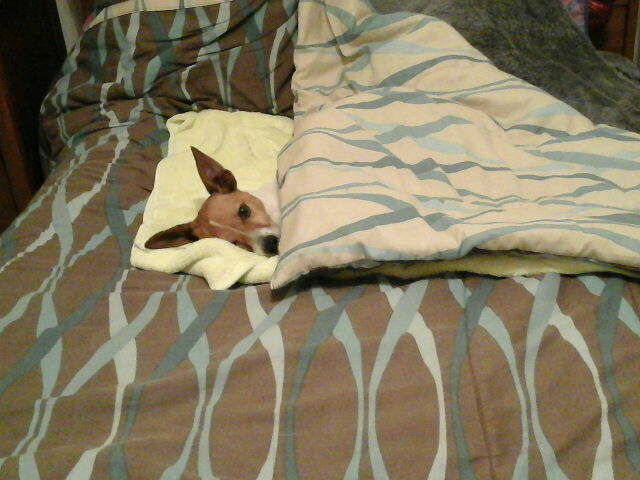 Jack Russell Terriers are burrowers and Misha can’t seem to get enough blankets! She sleeps on the self warmer even when the house is 80 degrees. Crazy dog! I’ve forgotten to move the tent when we got back in the house. While I read, Misha went back to sleep, or, tried to. It is one of those nights and she just can’t find the sweet spot. I don’t think this position is very comfortable. She finally got comfortable. Only it’s the people bed that she has taken over. As my nephew said when he saw this photo, “Now that is just adorable”…and he doesn’t throw around that word all the time. Misha has found her spot. Now where am I supposed to sleep? 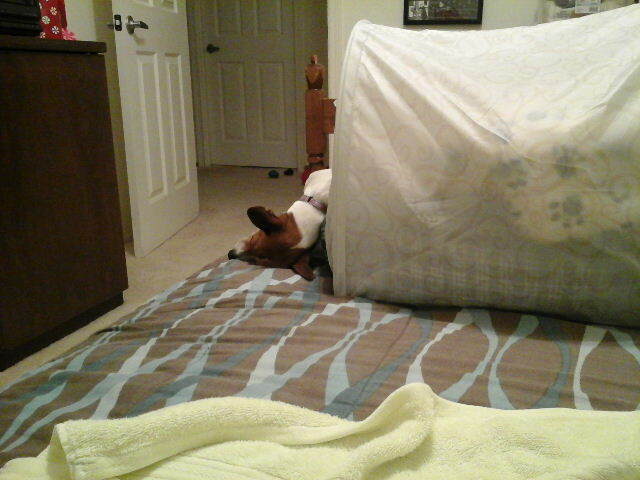 I guess the dog tent isn’t enough. Maybe I should buy her a self warming dog bed. I wonder if that would keep her out of the human beds?